Fishing Equipment Penn International two-speed reels. The SHOGUN has comfortable helm seating, large cockpit with fighting chair, full tower with dual controls, a galley, a marine head and forward V-berth. She is equipped with autopilot, GPS, VHF radio and all USCG required safety equipment including an EPIRB. Half-Day Price See website or call (808) 937-3955. 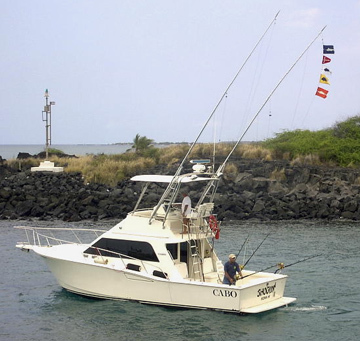 Three-Quarter Day Price See website or call (808) 937-3955. Full Day Price See website or call (808) 937-3955. Overnight Price See website or call (808) 937-3955. We are happy to fillet any catch under 50 lbs for your consumption, but prefer to tag and release billfish. If a billfish is boated, it belongs to the boat and crew although we are happy to arrange for a mount of your trophy catch.